My daughter Layla wanted to be Princess Poppy! What better way to add more color than.....a RAINBOW!! The rainbow is made from pool noodles and when I started adding the cotton batting for the clouds, I had an idea.....why not add Cloud Guy! I found an old doll in the donation box, popped off the legs, painted them blue with socks and attached him to the rainbow. There you go! 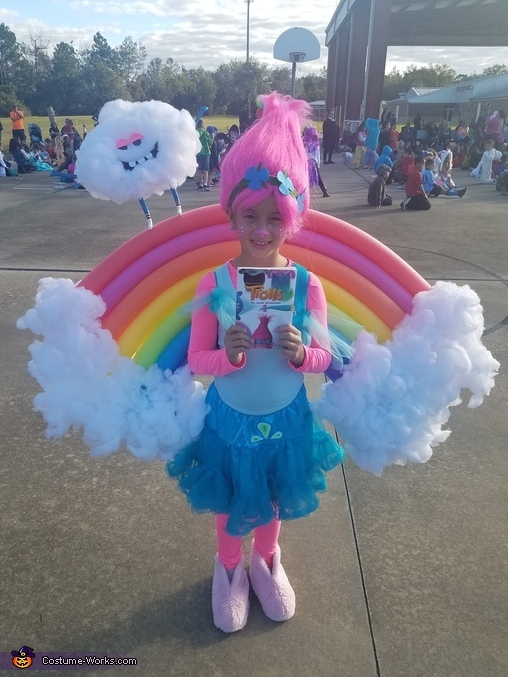 She loved it and the costume was a huge hit! Hi! Can you tell me how you constructed your rainbow, please? How did you keep the noodles connected and what did you do to them to keep their shape? Thank you!!! Hi, I started with bending the bottom noodle in a full "U" shape and built up from there. I used bamboo skewers to hold the noodles in place, cutting any excess or sharp parts of the skewer. Let me know if you have any other questions. Thanks! How did you attach the noodles for her to wear? I see straps like a backpack, but not sure how to attach the rainbow to the backpack straps. And then did you just hot glue the cotton?